Blue carbon is a term scientists use to describe the organic material contained within all the living organisms and soil found in coastal ecosystems. Together, this organic matter, combined with the carbon contained in land-based systems, makes up the stored portion of the Earth’s carbon budget. Climate change scientists hope to protect these two reservoirs of carbon, because the carbon that remains stored in land or coastal systems translates into less carbon released to the atmosphere, where it contributes to further warming. An American salt marsh, by the U.S. Fish and Wildlife Service. Wetlands are known to store large amounts of carbon, making them essential carbon sinks in the global greenhouse gas budget. Wetland plants take in carbon dioxide, grow fast, then die and decompose in low-oxygen conditions, meaning they take in much more carbon than they release. 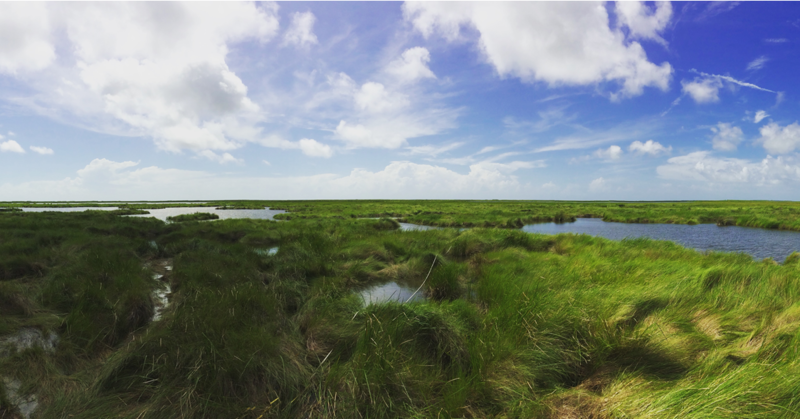 Saltmarshes are also particularly good at trapping carbon from outside the wetland, as marsh grasses slow and catch sediment traveling inland with the tide. Sediment (or soil) is basically decomposed plant and animal material, so it’s also made of carbon, and capturing the floating particles means the wetland accumulates this outside carbon as well as that from its own decaying plants. They’re so effective at this task, that saltmarsh soils accumulate carbon faster than any type of forest (about 40X more, on average!). A 1915 photograph of the dykelands in Grand Pre Nova Scotia, on the Bay of Fundy, previously extensive salt marshes. By AL Hardy in the Kings County Museum. They buffer us from the effects of climate change too; filtering storm runoff, slowing flood waters, and providing habitat for an increasingly threatened biodiversity. Saltmarshes, like many wetlands however, are under threat by continued coastal development. In Europe, dyking (mound- or berm-building) of marshland for agricultural and defence purposes has been occurring since Roman times. Marshland isn’t suitable for settlement or European-style agriculture, and was (and still is in some places) viewed as wasteland. In Eastern North America, saltmarshes starting being dyked 400 years ago for use by settler farmers. In Canada and the United States today, there are still areas where a lack of wetland conservation policy facilitates the continued loss of these vital habitats along with the valuable goods and services they offer us. At this point, an estimated 77% of saltmarsh on the Bay of Fundy has been drained, while an estimated 25-50% of saltmarsh has been lost globally. In some coastal regions, environmental managers and city planners are experimenting with softer methods for managing their shorelines. Instead of maintaining dykes, sea walls, and other hard defences, which are increasingly expensive under rising sea levels and increased storms, many are turning to saltmarsh restoration to provide a buffer for the areas they need to protect. In most cases, these are relatively simple projects, as simply returning the natural tidal flow to a dyked field can promote the return of protective saltmarsh vegetation. They found that overall carbon sequestration was very high, about 5X higher than a nearby saltmarsh that’s already transformed into a naturalized wetland after restoration more than 10 years ago. They also found that most of this carbon storage resulted from carbon secured from outside the marsh, as opposed to the decomposition of wetland vegetation within the marsh. Remember that wetland vegetation has to colonize newly flooded fields, and takes some time to decompose. It’s not surprising then that the massive rise in stored carbon over the few years post-restoration is therefore attributable to the incoming sediment caught by the vegetation. This has important implications for strategic carbon sequestration by environmental managers though. Carbon accumulation decreases over time in restored wetlands, as sediment fills in all the available spaces and the marsh starts to accumulate carbon mainly by decomposition. The initial stage after restoration therefore is crucial for capturing the most carbon. In the Bay of Fundy, this stage is especially important because of the exceptional tides and high sediment load in the Bay’s waters. The Bay of Fundy is a natural haven for carbon sequestration, if all that sediment ends up in the right place (like a saltmarsh). The researchers suggested that the simple design of the restoration, by opening only a few holes in the dyke, was important for giving sediment places to accumulate amongst the spreading vegetation. Without the restoration, the incoming sediment would have landed in nearby mudflats or in the open ocean, where the carbon is less efficiently stored. As carbon credits roll into swing and these projects begin to be viewed from a more critical financial perspective, it will be important for wetland managers to understand how much carbon these restored marshes are storing, and how that might change over time. Carbon trading could open up large funding pots for wetland restoration projects that benefit people and wildlife alike. Using the 2017 California carbon market price, the DUC project resulted in ~US$124,000 worth of off-set credits. Under the voluntary market, this amount falls to ~US$30,000. Either way, it’s an impressive calculation considering that saltmarshes aren’t currently recognized as an approved offset method in any of the regulated American markets, and Canada hasn’t yet picked up a market. Imagine if every farmer, every municipality, and every landowner with that “useless” wet piece of land next to the river, had incentive to restore and protect their wetlands. Shortly after a simple dyke breaching, restored marshes along the Bay of Fundy sequester massive amounts of carbon, and provide ongoing buffering and habitat creation services. All that from a couple hours on a dozer! ← Can the structure of a hurricane make it wobble? Hi there! I'm a botanist with a Masters in Environmental Science and Management from Ryerson University. I currently work in non-profit conservation in Nova Scotia. I like plants, wetlands, and wetland plants! On the sciencey side, I like to write about population-level response to climate change and management strategies for important species, but I'm also interested in how environmental outreach programs are assessed for success, how exposure to science and demographics affect environmental values and behaviours, and best practices for building community capacity in environmental stewardship. Check out my instagram @beckusminimus for photos of the awesome nature I see through my work.